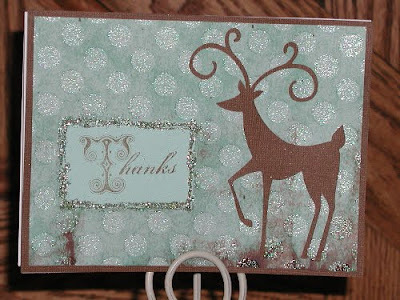 The past few days I've been creating Christmas thank you cards, which is also the latest challenge over at Winter Wonderland. I receive a lot of crafting supplies for Christmas, my birthday, even my wedding anniversary (such a dear, sweet hubby! 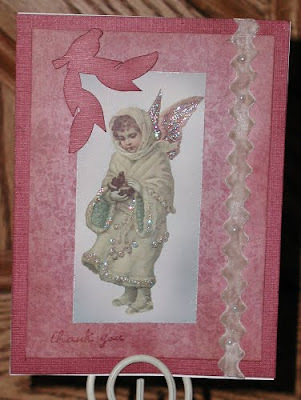 ), so when I make thank you cards, I try to incorporate what I received in the card. This year I got a Cricut Expression, the Storybook cartridge, and 50 States cartridge from my hubby (told ya he was sweet!) and my dear mother-in-law. My brother & dsil, Megan, gave me the Winter Woodlands cartridge. I've been playing and having so much fun getting to know my Cricut! And, of course, this post wouldn't be complete without saying "Thank You" to you for stopping by and for encouraging & inspiring me! Have a wonderful Sunday! WOW ... these are AWESOME!! So beautiful! What fabulous gifts you received (my DH got me slippers and a bug deflector for my car .. no crafty stuff, he things I have too much now) LOL!! Looks like you've figured out that Cricut pretty well already! Way to go girl! These creations are beautiful! 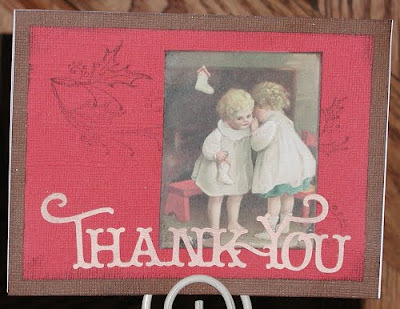 Your thank you cards are beautiful! I love it that you do this too, as it doesn't seem many people send thank you's anymore!